Buying tickets to a New York Mets game is easy to do online. Visiting a baseball game on your New York trip is a real American thing to do. Even if you don’t like sports I would still recommend it for the atmosphere. New York Mets play at Citi Field Stadium in Queens. The baseball season runs from April to October. A reasonable price for a good seat is between $20 to $85 a ticket. Tickets for matches that are held on Saturdays and Sundays are usually more expensive than tickets for weekdays. If the Mets don’t play on the date that you want, the New York Yankees might. 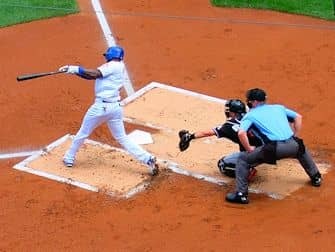 Buy New York Mets tickets now and pay no service fee and get free shipping (e-tickets) or choose free local pick-up! You can buy tickets to New York Mets by searching here for a date when you wish to visit a baseball match or view the table below. The tickets can be paid by credit card. There are three types of tickets: e-tickets, mobile tickets and paper tickets. E-tickets and paper tickets are shipped to your address or sent by email. You can also pick up the tickets from a local pick-up office (Monday-Saturday) in New York for free. If you are not able to print out your e-tickets, you can also drop by the office. The office location is very central, near Times Square. Mobile tickets cannot be printed, but should be showed on your phone at the entrance of the stadium. Picking e-tickets or mobile tickets is the fastest option and local pick-up is the best option for paper tickets. These options save you shipping costs, so I highly recommend them. Your tickets are guaranteed 100% authentic and delivered on time. The tickets are available at discounted prices as they are from season ticket holders who are not able to attend the game themselves. 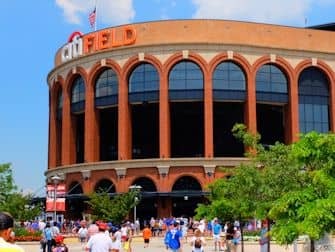 Sometimes the tickets are more expensive than the original price, this means that the New York Mets game has been sold out. Where Should I sit at a Baseball Game at Citi Field? When going to a Mets game at Citi Field, you’ll of course want to see and experience as much as possible. In the below overview I have marked the areas that I recommend for the best views in red. If you are mainly going for the atmosphere, then you could also go for tickets in the 500 section (above the area marked in red). The lower the row number, the more you will be able to see. The only tickets that I don’t recommend are for seats at the back of the field. If you sit here, you can only partially see the playing field. The Mets stadium Citi Field can easily be reached by subway. I wouldn’t advise to take a taxi as it isn’t practical. Also, you’ll have to cross the bridge, which makes the taxi ride even more expensive. Subway line 7 stops right in front of the stadium. The stop is called Mets – Willets Point station. Don’t be afraid that you’ll miss your stop – almost everybody gets out there. Before and after the game, the subway can get a bit crowded, never too crowded though. When Should I Arrive at the Game? Ideally, make sure to be seated before the beginning of the national anthem which is definitely part of the whole experience. That’s why you should aim for arriving about 30 to 60 minutes before the game starts. The easiest way to get back to Manhattan is to also take the subway. Line 7 stops at Grand Central Station, Times Square and Fifth Avenue. Eric’s Tip: Baseball is for everybody. Women, children and families are more than welcome. Bring your kids to a game and they will never forget it. If you don’t know the rules the game might take long. Personally, I usually leave around the eighth inning after the singing!